Astronomers have discovered two moons located behind Uranus after re-examining old data collected by NASA’s space probe Voyager 2. During a 1986 flyby, the space probe took a closer look at the planet and its satellites increasing the then-known number of moons around Uranus threefold. Since then, scientists believed there were 27 moons in orbit around the ice giant. However, two planetary scientists from the University of Idaho’s Moscow campus, Rob Chancia and Matthew Hedman, have re-examined Voyager 2’s old data and found what they say are two exciting discoveries. 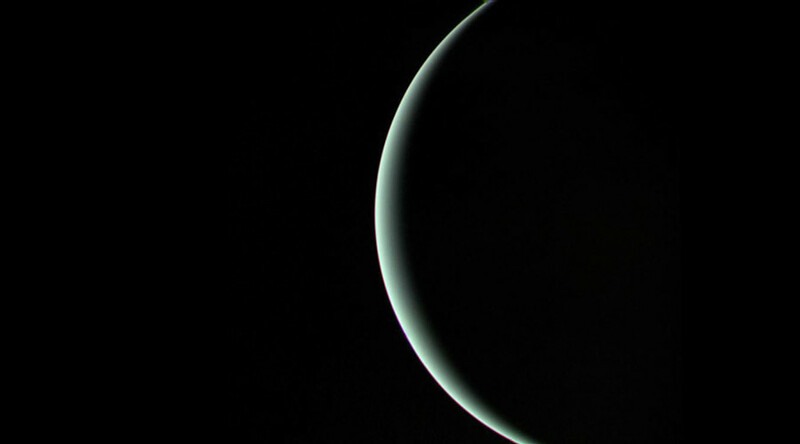 Uranus is surrounded by 13 dark and narrow rings. Chancia and Hedman noticed wavy patterns in two of the rings, Alpha and Beta, consistent with a gravitational pull from moons. “These moons are pretty tiny,” Chancia told New Scientist. So tiny, in fact, that they would only measure between 4 to 14 kilometers in diameter, which explains why Voyager 2 may not have picked up on them more clearly - even though “at least four of Saturn’s moons are even smaller”. “[The discovery is] certainly a very plausible possibility,” according to Mark Showalter, from the Search for Extraterrestrial Intelligence (SETI) Institute in Mountain View, California. SETI has previously discovered moons around Uranus and other outer planets. Showalter plans on investigating the two new finds further with the use of the Hubble Telescope which he says is “the best bet” at confirming their existence. There is still so much that is unknown about Uranus as the planet has been less explored in comparison to its much larger counterparts Jupiter (studied by the Galileo and Juno missions) and Saturn (the main subject of the Cassini project). Voyager 2 was launched by NASA in 1977 as part of a program to study outer planets Uranus, Saturn, Jupiter and Neptune. Thirty-nine years into the mission, Voyager 1 and 2 continue to travel through - and possibly beyond - the outer reaches of our solar system. In 2012, NASA announced that Voyager 1 had become the first manmade object to enter intersteller space.